The performance of any reliable process starts with the most basic components. This applies also to the selection of a process valves and pumps. Cement is always an abrasive and harsh medium to handle and transfer which highlights importance of the right selection even more. If you settle for a conventional product, be prepared for a short time planning in maintenance. such as butterfly valves, knife gate valves, switching valves and hammer valves. In addition to the conventional technologies, there are option such as pinch valves, specifically designed for abrasive conditions. Pinch valves have been in the industry for many years but it is still quite new to many cement manufacturers. A pinch valve can be used throughout the cement process, the most typical applications including switching/diverter and silo isolation valves, blow pot valves and various other isolation and control duties. The most important factor for valves utilized in cement handling for example in pneumatically conveyed systems is how well and tightly the valve is able shut off, since a very small amount of cement leakage becomes quickly a large leak due to the high velocity wear. One contaminated silo can cost up to €230,000/US$250,000 when product loss, wasted time and inconvenience to plants operations are counted together. A pneumatic conveying systems based on blow pots are one of the most typical transfer methods in a cement plant. The valves in a blow pot are typically cycled every three minutes and are under a high continuous stress. It is very important that they close tightly on the abrasive cement powder being conveyed to the silos and don't allow any leakages. A pinch valve utilizes a rubber hose (or tube) that is pinched by one or two bars to squeeze the rubber hose closed to prevent flow. When closed, the valve is 100% air and product tight and no leakage occurs even with small particles in the medium. The greatest advantage of pinch valve is that when being in open position, it is 100% full port and acts as an extension of the piping system. It has smooth inner surface with absolutely no pockets or cavities which could lead to material buildup and eventually valve failure. Typical service interval for a high quality Flowrox pinch valve on silo isolation is two to five years. When the rubber sleeve fails it can be quickly removed and a new one installed in a very short time frame and with just a fraction of the cost compared to new valve. In more than 95% of the cases the rubber sleeve is the only spare part required by cement plant. Cement manufacturers utilize various pump types in the cement manufacturing process, for example in pumping grinding aids such as glycol, amines and acetic acid to help cement particles to flow efficiently. One of the applicable pump types for grinding aid and other cement duties is a peristaltic hose pump, which are based the peristaltic effect: as the cylindrical rotor rotates along the hose inside the pump, the process medium gets pushed forward through the hose. Newest and the most advanced peristaltic designs use either single or double rollers, which can eliminate 80% of the friction caused by sliding shoe designs, allowing the pumps to run at higher RPMs. A roller design pump can run at higher rpms and still produce significantly longer hose lifetime than a shoe design pump. The roller design requires only a fraction of the glycerin used in shoe designs. The number one determining factor of a peristaltic pump hose lifetime is the number of times the hose is compressed even though the harsh medium also has an impact. A majority of peristaltic pumps compress the hose two times per revolution. A Flowrox Peristaltic Hose Pump with the single roller compresses the rubber only once per revolution and produces the longest hose lifetime of any peristaltic pumps and also superior service interval over other pump types in continuous and abrasive duties. In almost all cases, the hose lifetime of a Flowrox single roller pump is at least two times longer than with a shoe or multiple roller designs and may even be four to five times longer. Flowrox Peristaltic Hose Pumps have high turndown ratio, making them ideal for medium dosing and transfer. 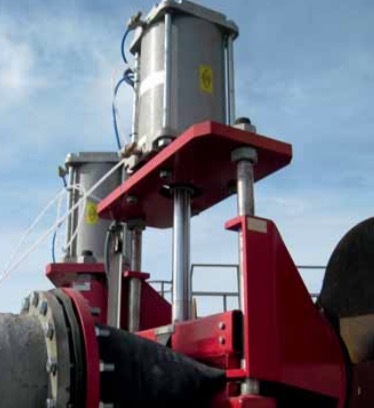 They provide accurate dosing even with harsh mediums like grinding aid additives or cement slurries as the pump discharge flow does not depend on the pipeline pressure. The operators do not have to worry about overheating even with high continuous flow rates. Flowrox is a manufacturer of heavy duty industrial valves and pumps. In addition, it offers its customers flow control automation solutions and comprehensive after-sales services. Headquartered in Lappeenranta, Finland Flowrox Group has subsidiaries in USA, Australia, South Africa, China and Russia.